A lot of runners dream to run the Paris Marathon. Others have doubts if it’s worth to be part of such a crowded competition. I’ll be honest, this race in Paris wasn’t in my plans. But destiny plays with us, on April 2014, one day before boarding on our around the world trip I got an email telling that I won one slot on the race. One year later, after crossing Europe, North Africa and South East Asia, I was heading to Paris. 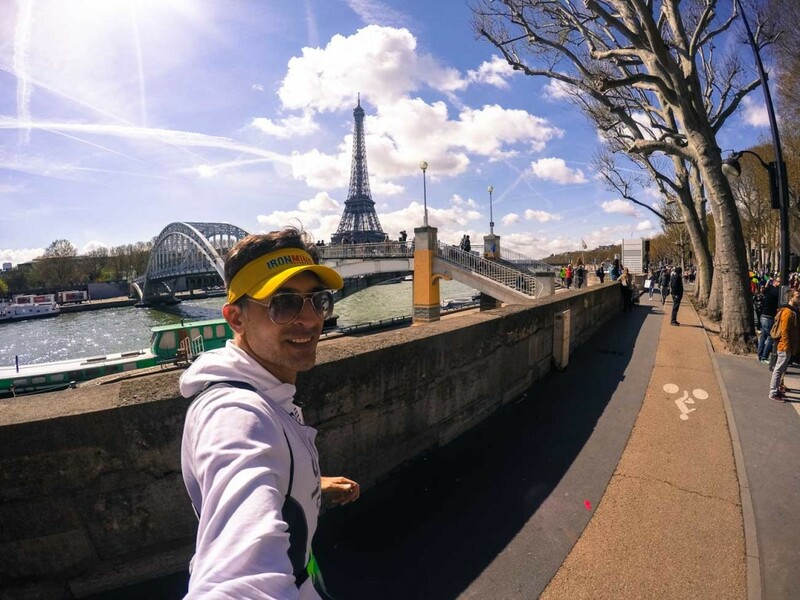 Now it’s time to write our Paris Marathon Review and give you the best tips for the race and the trip. 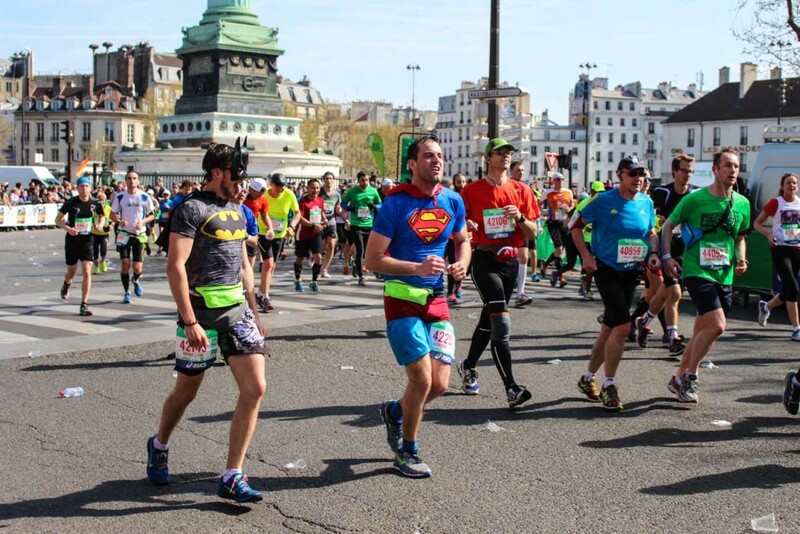 Registration can be made on Schneider Electric Paris Marathon website. If you don’t get a slot there are 2 other options. To run for a charity or to book the race via a tour operator. The list of charities and official tour operators can be found here. The online process was easy and straightforward. I paid using my Brazilian credit card without any issue. 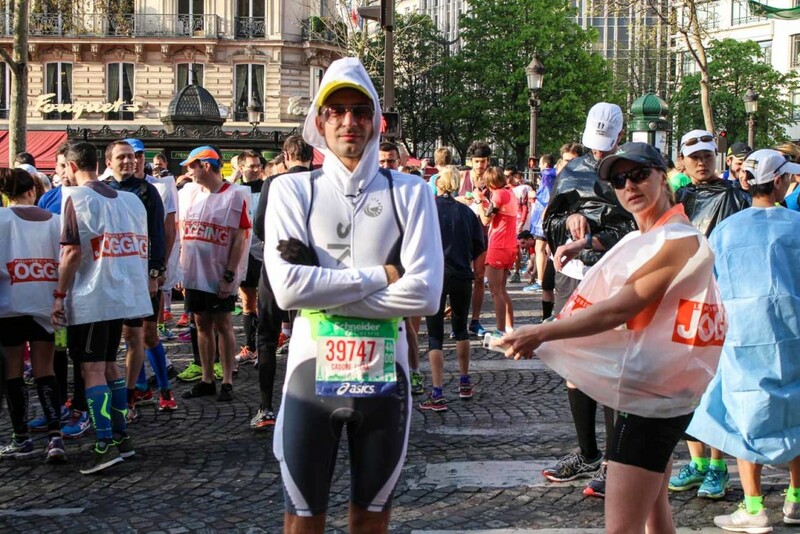 The BIB & race bag are available a few days before the race at the Paris Marathon Expo, aka Le Salon du Running. It’s located at Parc de Expositions de la Porte de Versailles, to get there take the metro line 12 and drop at Porte de Versailles. In order to get your race number and bag you MUST present a medical certificate mentioning: “no contra indication to running in competition”. Also bring your passport or proof of identity, and the confirmation email. With all the docs in hand took me less than 5 minutes to get my race number and bag. The staff was very polite and friendly, making jokes of my “french tre bizarre”. 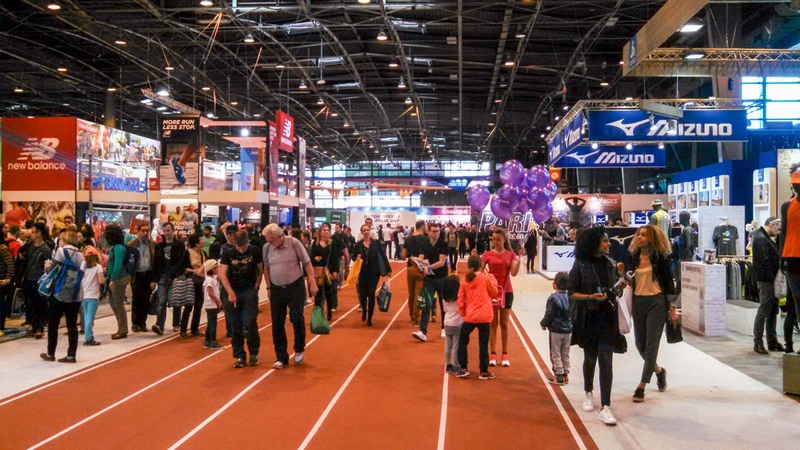 Le Salon du Running is huge! Over 200 expositors showcasing the latest products for athletes. There were several running & triathlon associations and other race organizations too. One that caught my attention was the Marathon du Medoc, run & wine, cool! 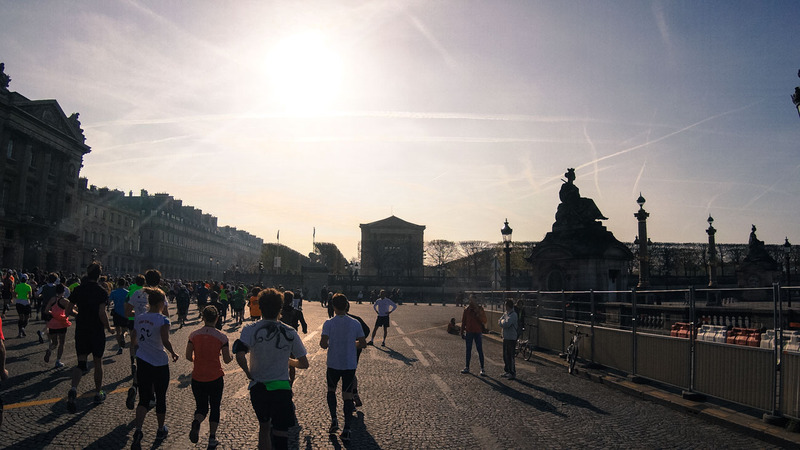 Paris Marathon Review Tip: go on the first day, it’s not so busy so you can enjoy more. Yes, it’s a stunning race. You have the streets of Paris to yourself, well, to you and another 50.000 runners. Anyway, the race starts on Champs Elysee heading to Place de La Concorde. Then Rue de Rivoli passing by Le Jardins de Tuileries, the Louvre Museum and La Place de la Bastille. From there runners will cross about 10km in the Bois de Vincennes Park and head back to La Bastille via Rue de Charenton. Then it comes my favourite part, from km 23 till 31. The race follows the River Seine, with beautiful views from the Ile de la Cite, Pont Neuf, Museu d’orsi and Eiffel Tower. The last 10km passes by the Bois de Bolougne Park until reaching the finish line at Rue de Foch. I thought that the Paris marathon course was a flat one. Wrong! Not that you will face steep hills but expect some ups & downs. In the end, my Garmin registered an elevation gain of 220 meters. The Arc du Triumph is the best landmark to plan your way to the marathon. Take the Paris metro and drop at Charles De Gaulle-Etoile station. The metro is efficient and is the best way to move around on the race day. We were staying in the 17th arrondissement and got to the race in about 40 minutes. The race officially starts at 8:45am. Depending on your expected finishing time your start can be from 8:47am to 10:05am. I was expecting to finish in 4 hours, so I have to find my corral, and wait my start at 9:30am. As usual the main complaint in every single race, there are few toilets. Once you entered your corral you can’t go out and the toilets in that area weren’t enough for the thousands of runners. As result, athletes using the streets of Paris as a toilet. I found quite hard to keep my pace among thousands of runners. The first 10km were to warm up, I didn’t stop in any aid station till Km15. Talking about aid stations, they were spread in every 5km, with water, isotonic, fruits. I found it well organized and plenty of helpful staff. Between the km15 till km 32 I was feeling great and ran my best, even in the crowded streets. Only after the km 33 there was more space on the streets but then my legs were getting heavier. I kept running and stop at km 40 to sip some wine from the Marathon du Medoc stall. The last and very needed boost! My time? 4 hours and 3 minutes. My target was to finish in 4 hours, very happy with the result. After the race I was feeling very well. Ate some fruits and a sandwich, drank Coke and later enjoyed a very cold beer. It’s a scenic race, Paris is a stunning city. I love the idea of running and sightseeing, even better if you don’t need to worry with the traffic. I tried to keep my pace and enjoy the view at the same time. I did a few stops for pictures and don’t regret, I was there to enjoy. The crowd was special, thousands of people cheering: Ale Ale Ale, Bravo! Also there were many bands playing music along the course. It really helps to keep you going! Nat and I planned 4 meeting points, at Chateau de Vincennes on Km 12, at Place de La Bastille between Km 22-23 , at Place de Varsovie on Km 29 and at the finish line. Unfortunately she got stuck on the Metro and we missed each other at Chateau de Vincennes. I managed to do a quick stop to kiss her at Place de La Bastille. She didn’t see me at Place de Varsovie but spot me on the finish line. Like it?! Pin the Paris Marathon Review for later! 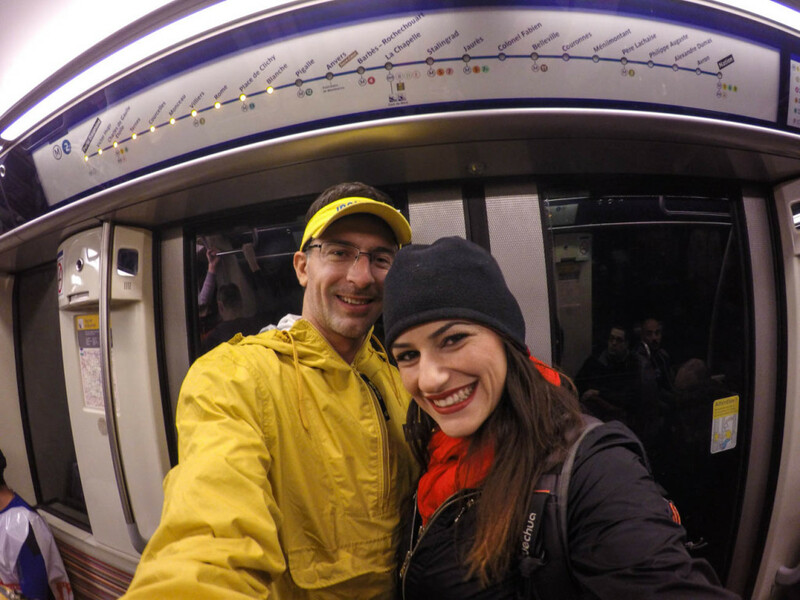 Paris Marathon Review Tip: If your partner or friend wants to take some pictures and cheer for you, plan ahead the meeting points and give some time for the transit between the places. The metro lines are packed during race time. That’s a tough point. A lot of people ask about the training schedule for the Paris Marathon. We can not say that there is a single recipe that suits everybody. It all depends on how fit you are, what is your expectation, time available for training, dedication… A lot of factors. My case was an interesting one. I ran the Ironman Brazil back on 2012. On March 2013 was submitted to a hip surgery and stop running till October of that year. I started my training 7 months before the Paris Marathon. But this time I had an extra challenge, no fixed address and without a “normal” routine. Since we were travelling around the world I did my training in 7 different countries, a total of 19 different cities. Istanbul, Izmir, Pamukkale, Cappadocia, Chiang Mai, Siem Reap, Bangkok, Boracay, Bohol, Manila, Koh Phi Phi, Phuket, Ao Nang, Koh Tao, Koh Phangan, Langkawi, Bologna, Reggio Emilia and Paris. One day I was running in Istanbul, raining and 6ºC, on the following day I was in Bangkok running under the sun with the thermometer hitting 35ºC. Another challenge was to find a flat course for the long training, specially in some of the Thai islands like Koh Phi Phi or Koh Tao. The bright side was the amazing landscape I enjoyed during my training. Cappadocia on late October is gorgeous, the beaches of The Philippines, the Bosphorus in Istanbul…. Can’t complain at all. In addition to the temperature changes, the main challenge for me was to adapt to different foods, ingredients and seasonings. I lost about 8 kgs during my training for the Paris Marathon. Mainly because took me a while to get used to the food in each new country. In average I was training 1 hour per day from Monday to Saturday and between 2-3 hours every Sunday. 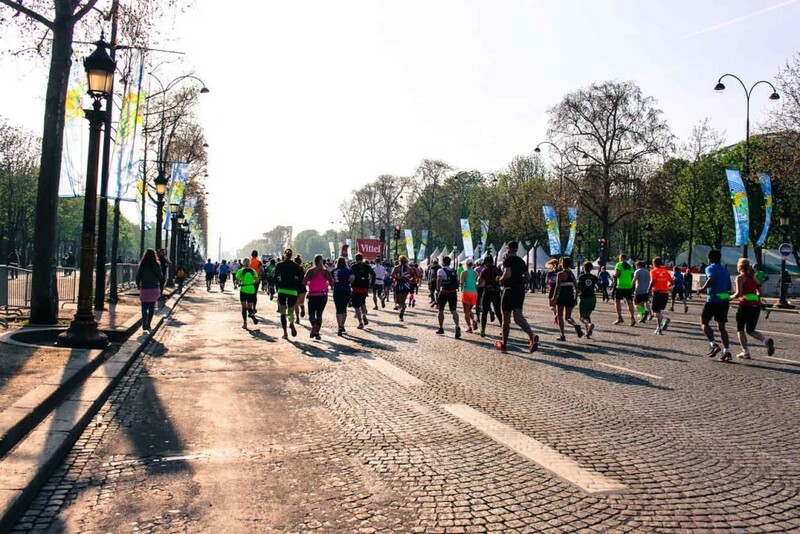 Paris Marathon Review Tip: Start training about 6 months before the race if you already have done one half marathon, or earlier for those who haven’t. ALWAYS train with a coach, don’t follow a spreadsheet just because a friend of a friend told you to do it. A certified coach can evaluate your performance and minimize the risk of injuries. Also, go see your doctor before start training! Roberto Lemos from Ironmind was my coach for this challenge, he is known as “The Master”. Also I can recommend Lucas Helal from Luquitri Assessoria Esportiva, he does a great job with his online coaching system. Lucas trained me for the Ironman Malaysia. » Paris Marathon Review Hotels – Where to stay in Paris? Marais: Is a great area for bars and restaurants. Check the best offers at Booking.com or Agoda. La Villete: Quieter area with nice runs along the canal. Check the best offers at Booking.com or Agoda. Trocadero: A beautiful neighborhood quite near to the start area. Check the best offers at Booking.com or Agoda. Or do your research on Booking.com or Agoda we really like their search tool. An alternative to hotels is to rent a place using Airbnb. From a room in someone’s house to a fully furnished penthouse. Sign up to Airbnb with this link and get USD 20 of credit! 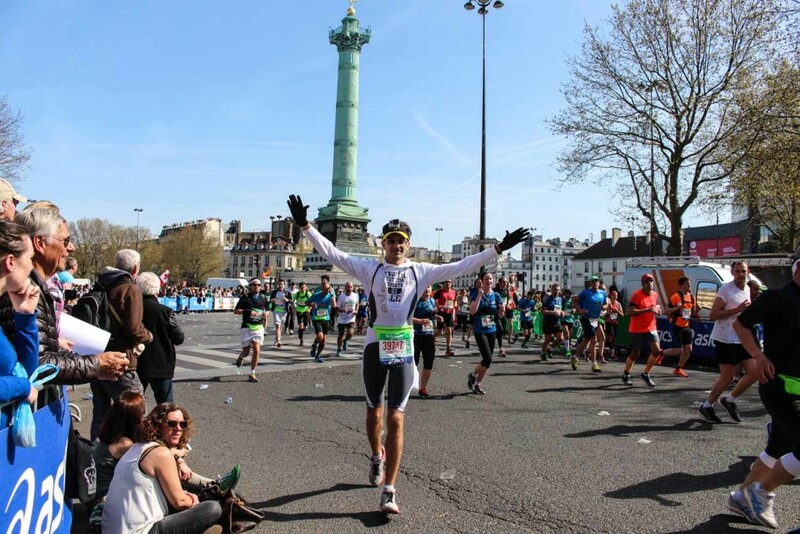 Start your Paris Marathon Travel Planing on a saving mode! Paris Marathon Review Tip: remember that metro lines 1,2 & 6 goes directly to Charles de Gaulle Etoile station, where the race starts. » How to get to Paris? That’s easy. Paris is served by 3 airports, 7 train stations & international bus station. Over 50 airlines fly to Charles de Gaulle Airport, the biggest one in Paris. If you are flying from a destination outside Europe is very likely that you will land here. To get to city center just hop on the RER train. Orly Airport is another airport with flights to Europe, Africa, Asia and Americas. This airport is also connected to the city center via RER train. Beauvais Airport is used mainly by budget airlines such as Ryanair and to European destinations only. To reach the city the easiest way is the shuttle bus. Does not matter where you flying to, always research several airlines before booking your flights. We really like Skyscanner, they compare several airlines and you can save time & money. If you fancy travelling by train, you will find plenty of services connecting all Europe to Paris. We travelled from Milan (Italy) to Paris by train, but we choose a route via Switzerland to enjoy the Alps landscape. This trip was done using Eurail Pass, absolutely hassle free! Buy your Eurail Pass here! Or for further info check this article on how to travel in Europe by train. In theory, April is already spring. Or at least my concept of spring is sunny days with temperatures ranging from 20º-25ºC. We arrived in Paris with freezing 8ºC. I was freaking out! Usually the temperature would rise during the day but before 9am was quite cold. I went to the race wearing my trisuit, legging, a hoodie, thermal jacket & gloves. I stripped off the jacket & legging minutes before entering the corral. The jumper and gloves I took off only after 3 hours running. My Brazilian blood and the months training in South East Asia made me a bit sensitive to the cold. Paris Marathon Review Tip: Arrive a few days before the race to get used to the weather. 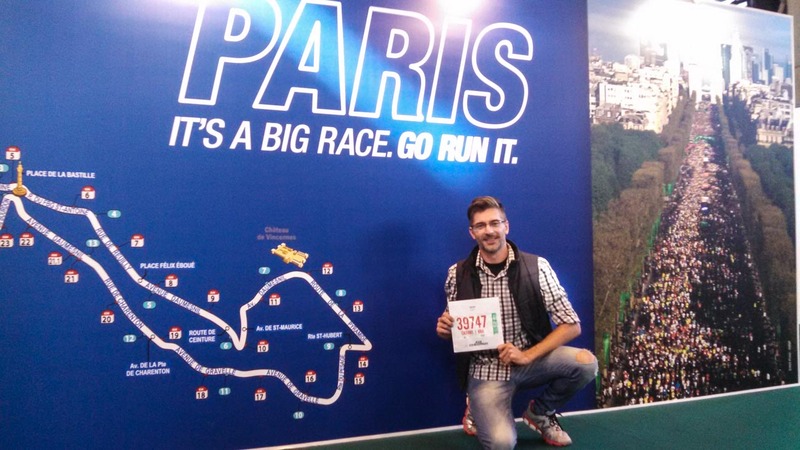 I ran the Paris Marathon with my New Balance M890v4 with a pair of anti-blister socks from Nike. The runners lasted me a solid 1 year of intense training for the marathon and the Ironman Langkawi. 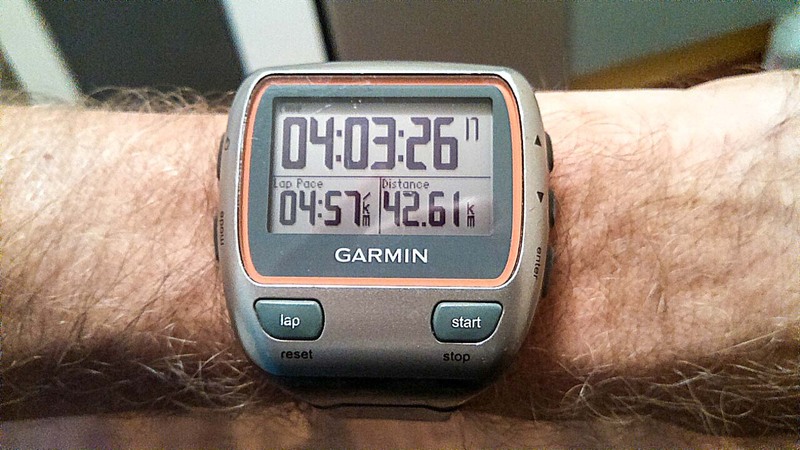 To track my performance I use the Garmin Forerunner 310XT. Strongly suggest to get a visor or a cap to protect from the sun. Nike featherlite visor is a great product. Remember that I mentioned the low temperatures, so consider buying a pair of leggings, Nike and Mizuno are good options. A Go Pro Silver 4 was my choice to record some videos and take pictures during the race. Will I race it again? Absolutely! While writing this Paris Marathon Review I even checked the date of the 2017 edition. The Paris Marathon is a well organized and beautiful race. If you have visited Paris before it’s a great opportunity to see the city from a different perspective. If it’s your first time in Paris you will be amazed by the beauty of the city. 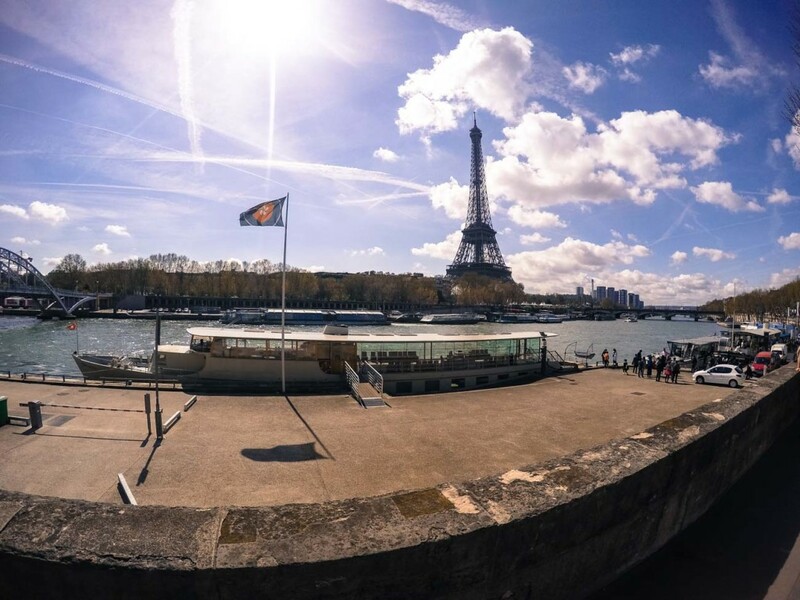 Make sure to stay at least one week after the race to explore Paris. I told Natalie that after racing the Paris Marathon, Chiang Mai Marathon and the Ironman Langkawi in Malaysia, I would stop for a while. Well, it’s over a month without training, time to chose a new race and start everything again! 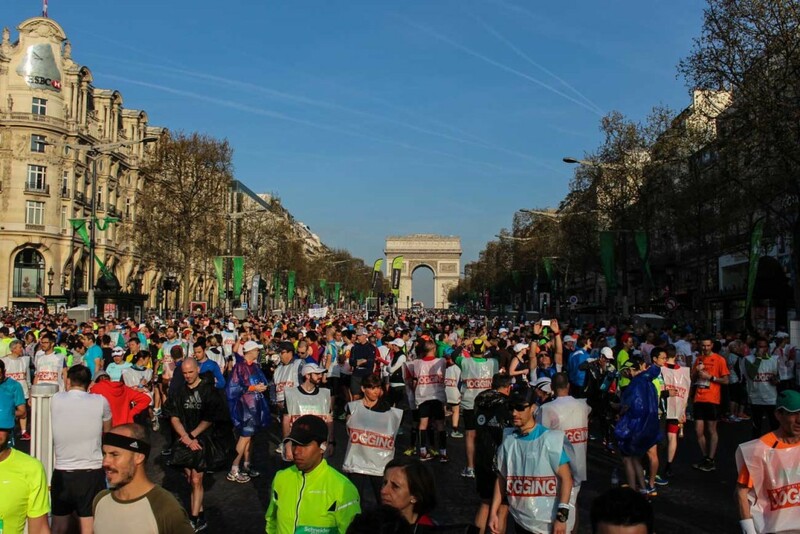 Paris Marathon Date 2019 – April 7th. Paris Marathon Date 2020 – April 12th. Do you run marathons? Planning to run the Paris edition? 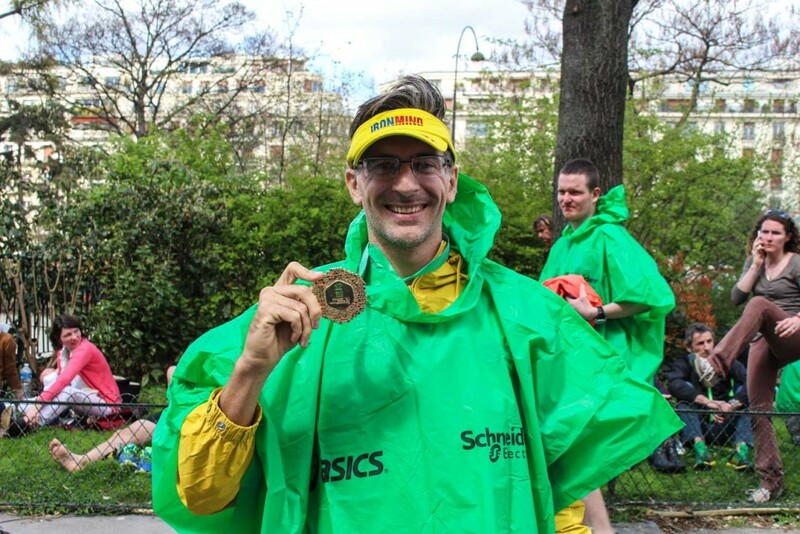 Did you find our Paris Marathon Review useful? Let’s connect! EEK!!! I did the Paris marathon 10 years ago!!!! It was my one and only marathon – I’m definitely more of a half marathon girl – and it was great to do it in Paris. My impression of it at the time was that it was a very fast group, mostly dominated by men. So the downside was that, as a slower runner, there weren’t as many people cheering when I was finishing up. But on the plus side, I actually placed fairly good overall since there were so few women. Wow! 10 years ago! I bet it wasn’t that crowded. Do you still do some runs? WOW! If I had to pick a place to run a marathon, Paris would be it. Great tip to set a meeting point in advance for pictures. Congrats on the time! Planning the meeting points was a great idea. There are so many runners and spectators that is really hard to find each other. Congrats! I am so not a runner. I’ve done 3 miles a couple times but that’s the longest I think I’ll ever do, so I’m always impressed by people doing marathons. And if you’re going to do one Paris seems like the person place. Tks Megan, I started to run few years ago and couldn’t run more than 30 min. Now I’m crazy about it! What a great place to run a marathon! I can only imagine. Epic place to run a marathon and so inspiring! Did you really mean 50K runners? OMG, that is crazy. How on earth they can organize a race of that magnitude is amazing to me. 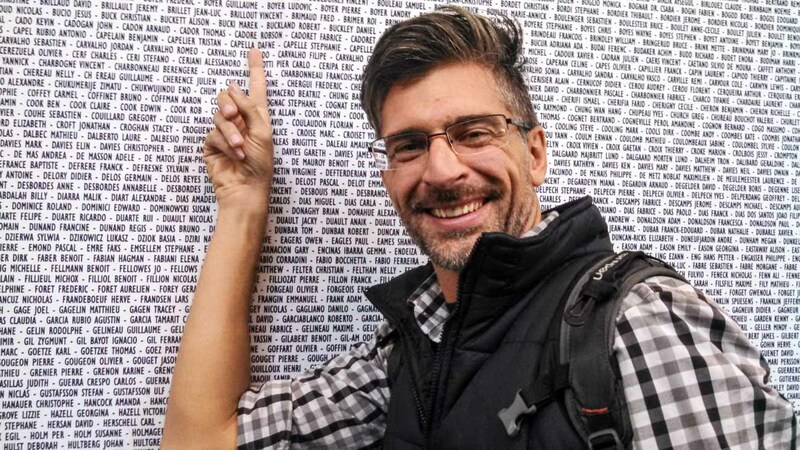 I wish you all the luck, very cool to have your name posted up there. I hope you do well. 54k to be precise…. I was really impressed on how organized the race was. This is really french, right? They were promoting the marathon du Medoc in a very efficient way. Wow! I have heard about so many marathons in great cities. But this tops them all! Congratulations! I’ve always wanted to run a marathon abroad. The closest I’ve come was a half marathon in Singapore. Your training regime sounds so exciting, being able to explore all these other countries at the same time:) I’m a keen runner but a marathon has never appealed to me, although I think doing one abroad would be more motivating. Credits to your partner for being so supportive of your hobby! The training was tough but I can’t complain, I ran in incredible places! Really impressed you manage to prepare for a race while traveling, that may have been more difficult than the race itself. Great article! Really m also surprised because during race you are going tired and you cant manage both but Robson doing well and complete both task. Amazing result with training being pretty much all over the world! I ran Paris last year, my first marathon (I ran 4 in total last year, but that was not my plan at the time that I ran Paris!!) and two days after I already signed up for 2016! Absolutely loved it! What an amazing city to run in. 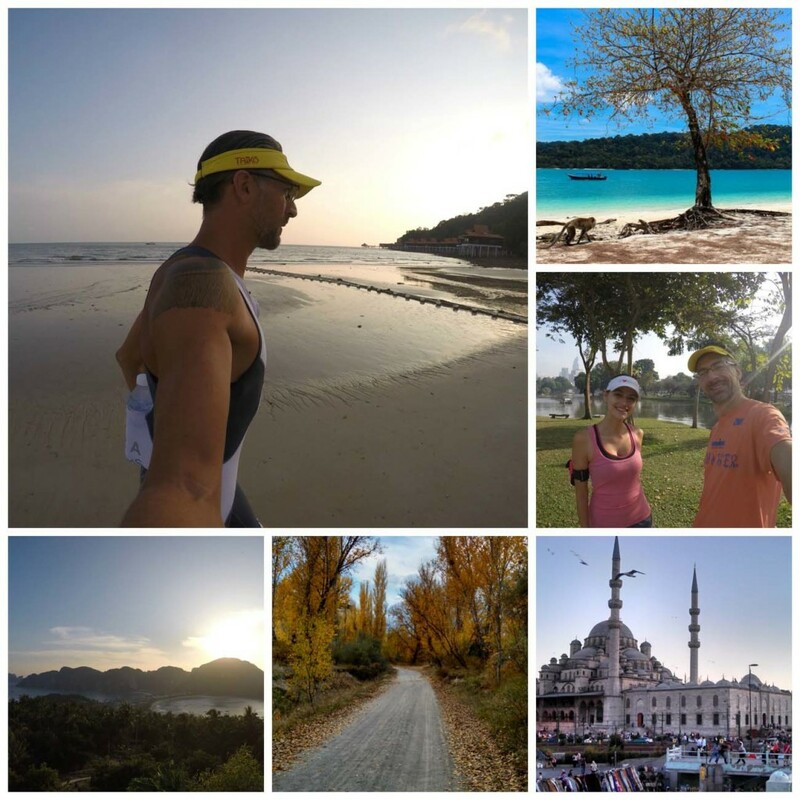 I’m very lucky that my husband runs too – we try to combine travel and running as much as possible! Congrats! Me and my husband are planning to run the Paris Marathon 2017. It will be our first marathon! Will you be racing again in 2017? By the way, I am from Izmir and currently living in Istanbul. You should consider Istanbul Marathon (crossing the Bosphorus bridge and changing continents, from Asia to Europe) and the Cappadocia Ultra Marathon (if you enjoy trail runs). They are both unique experience! Good Luck on the Paris Marathon next year, it’s a beautiful race! Last year, when we were there we did the 7Km Nike Run at the Asian side and it was great fun! Thanks for stopping by and wish you two all the best! im running the Paris marathon this year, it will be my first marathon. 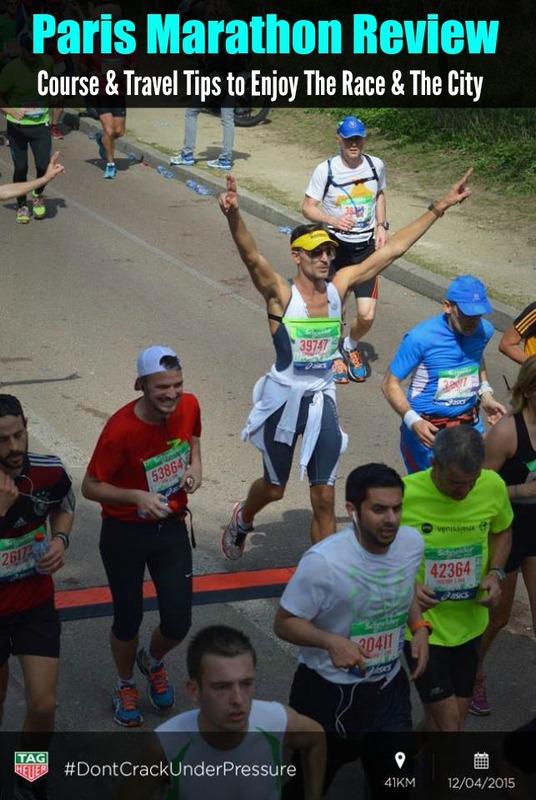 Do you have any tips for a first time marathoner and any tips for the Paris marathon? Don’t do anything different from your training/nutrition prior and during the race.